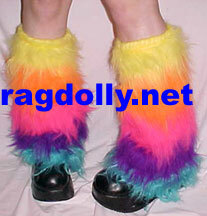 Our legwarmers are an excellent accessory for clubbing and everyday use. Why buy a new pair of shoes when you can just dress up your old ones? They are added over boots, sneakers, or platforms shoes and are very comfortable with elastic sewn in at the top. One size fits all and even fits plus size. They are also good for the cold weather, and can be worn over pants and hosiery. There are not many colors currently available because we handmake them. We have not been able to find a good fur supplier with anything other than just solid black these days. If you know of one, please let us know. These are made of 100% synthetic fur.